Vintage tweed coat (via Beacon's Closet), Theory draped sweater, Thrifted vegan leather midi skirt (I love this one too), Thrifted fringe chain necklace (similar here), Rebecca Minkoff snakeskin flirty (also seen here), Hinge booties. Shot by Isaac Lacey. Isaac and I took these snaps last week in the Financial District while we were picking up a tux he rented for a wedding we went to in upstate New York this past weekend. I loved the soft light streaming through the gap in the tall buildings: a fun and refreshing change from the backdrops we're used to in Brooklyn. And sure, we might be approaching the tail end of the season, but is it wrong to still be inspired by Fall? Leaves changing colors; the smell of fireplaces burning; warm, cozy blankets and flannel sheets. In spite of the encroaching cold, Fall for me always feels warm and rich. It's the season of hot toddys, the flavors of cinnamon, nutmeg and apple spice. 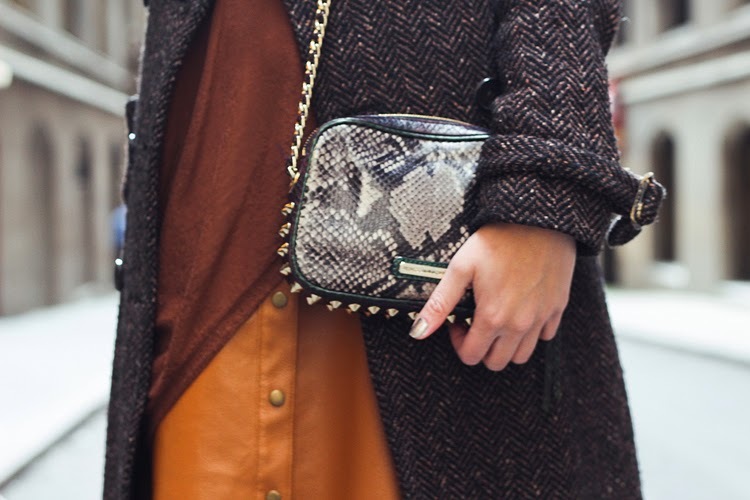 And when it comes to clothing, it's all about warm neutrals mixed in with rich hues of ochre, red, orange and brown. Lovely look with these fall tones! The long coat en bag are great! Look gorgeous!